When renting a car, it's not always easy to figure out if you need insurance for it. When reserving the car online, you might notice an optional fee for either insurance or something called a CDW or LDW. 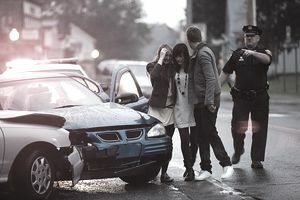 It is a collision damage waiver, also known as a loss damage waiver, and it technically is not an insurance coverage. It's a waiver of responsibility. By purchasing a CDW, you will be not be held accountable for any loss or damage to a rental car, which can be very helpful if you find yourself in an accident while driving it. Sounds like a no-brainer, right? Well, some fine print does exist on a CDW. It commonly states that if you violate the rental agreement in any way, the purchased waiver will not apply, so it’s important to know the rules of your car rental agreement and follow them precisely—especially if you’ve paid extra for a damage waiver. It's important to understand that while a CDW typically covers all damage to the rental vehicle without charging a deductible, that coverage is limited to only that vehicle. If you are in an accident and cause damage to property, including any other vehicles, the CDW is not relevant. That damage will need to be covered either by your personal insurance policy or by any supplemental insurance you purchased. The price for a CDW varies based on location, rental company, and the type of car you are renting, but expect the cost of the CDW to potentially be as much as 50 percent of the rental rate, maybe more. For example, if you're renting a car for $40 per day, purchasing a CDW on top of that can reasonably pushing your expense to $60 per day or more. In comparison to any other coverage available to address the physical damage, a CDW can be valuable, especially if your personal insurance policy has a high deductible. As well, coverage from any other source most likely will still leave you responsible for rent during the days the rental car is being repaired. Those costs can add up very quickly. Adding insult to injury, you’re paying money to fix a vehicle you’ll never again benefit from driving. With a CDW, however, you’re covered. For example, a driver on vacation hits a guardrail and puts a large dent in the passenger side door of his rental vehicle. The driver would not have to worry about a deductible or paying for repairs if he purchased a collision damage waiver, which will pay for the repairs in their entirety. Without a CDW, his personal policy may still provide coverage, minus whatever the deductible is, and the rental company still can charge rent during the time the vehicle is being repaired. When making your decision, compare all these factors. If you have good insurance and a low deductible, it might not be worth it to pay for a CDW, especially if you spend a lot of time in a rental car. For example, if you're paying on average $20 per day for a CDW and your personal policy has a deductible of $250, it takes only about two weeks of driving a rental to spend as much on a CDW as your deductible would cost. The bottom line is that the value of a CDW depends on several factors you need to weigh. The Accident was Your Fault! Now What? Do I Need to Report a Car Accident to the DMV?